Are you tired of working on your vehicles outside under a tarp on your back in the heat, rain, or cold weather? 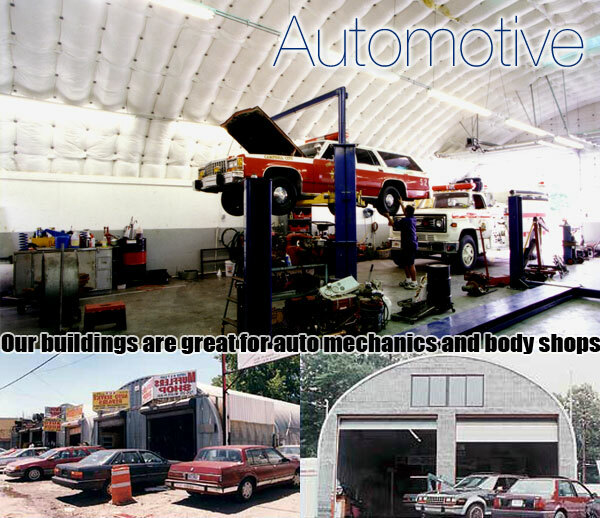 Archcore has the perfect mechanic workshop and repair building for you. Our one-size nut and bolt construction design is simple to erect, and requires no heavy equipment, just basic hand tools. All our buildings are pre-engineered at the factory prior to shipment to your job site. Every building component part is pre-formed, pre-punched and pre-drilled, and they require no welding. This allows for a fast assembly and cuts down work on the site during construction. Grab a couple buddies over a long weekend and you can erect a typical arch building workshop model. For those of you that want or have a carlift, Archcore buildings come in numerous heights allowing you to design the perfect pre-fabricated steel automotive workshop for your specific needs. Use a "P" or "S" straightwall arch model and the lift can be practically adjacent to the straight sidewall!! Archcore steel buildings have no framework on the interior so they offer you a large open building for all your automotive repairs and scheduled maintenance. Archcore pre-fabricated auto garage kits are 100% American made, with only US steel. The heavy gauge of steel we offer combined with the deep corrugation design make Archcore steel buildings extremely strong and able to withstand the toughest weather conditions including winds of up to 170 MPH. Whether it is harsh wind conditions or heavy snow loads, Archcore steel buildings are pre-engineered to meet your local codes. They are very popular in tornado areas, as the high winds tend to roll off the building, offering superior protection for your vehicles. Due to heavy gauge Galvalume steel and the heavy corrugation, Archcore building kits offer the utmost quality steel building to protect your tools and vehicles. Whether you need a body shop, vehicle repair building or parts storage, Archcore steel buildings has you covered.